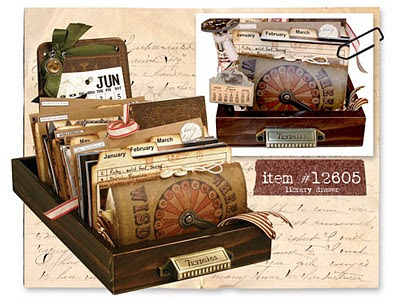 We love the library drawer from 7gypsies especially with the latest Postale goodies that fit perfectly inside. We thought you might like them also and bundled some items together that we think you will enjoy. This one from talented Ranjini Malhotra, get more instructions on this lovely here and be sure to check out her blog here. Also, love this from Ann Mabee (from the 7g website).....she adds the best details! If you are feeling lucky and want the chance to win the library drawer and goodies, please leave a comment by Monday the 4th at midnight. We will announce the winner on Tuesday the 5th. I love 7 gypsies. I think I have a gypsy soul that would be satisfied with a win of such wonderful product. Wow. What a phenomenal giveaway. What a wonderful bundle of goodies. I love this line! I love this so much!! Would love to win! What an awesome goody drawer! Love the idea of using a library drawer as a display. Thanks for the fun giveaway! These look fabulous! I love 7 Gypsies but it's not available anywhere near me. I just returned from the library and although I love computers I sure miss the days of flipping through a library drawer. How fun to make one as a display in my home! what an amazing giveaway! Love it all Thank you for the chance to win. Wow what a great giveaway. Thank you for giving us followers a chance to win some great items. this would be awesome! pretty please pick me?!! thank you for this candy! Love all these amazing goodies!!! Best of luck to everyone!! To quote Melissa Etheridge: "I wanna see how lucky, lucky can be.."
What an awesome Gypsy goodie prize - I am feeling lucky - every day! Simply beautiful--and I would love to win! Yes I do feel lucky! I LOVE all things gypsy! You are soooo inspiring. Thank you. Deb- I am a gypsy girl through and through. Would love to win these goodies! Thanks for the opportunity. i have no idea how to setup my google account so that i don't appear as anonymous.. but i would love to win! love the collection and as always, loving your work..
What a fabulous giveaway.. Such lovely stash! Such wonderfully talented artists and such beautiful work! They inspire me! Of course 7 Gypsies' goodies always inspire and the new Postale items are yummy! Ooooo! You are awesome--thanks so much for a chance to win these super cool goodies!!!! Wow! Love this giveaway. Thanks for the opportunity. yes please. I hope I get lucky. Thanks for the chance! What a wonderful giveaway! I hope to be so fortunate to win! Whoever does, will be most happy indeed! Oh, my gosh! What a generous and wonderful giveaway! I love your blog (check it every day) and have learned so much from you both. Your creativity is inspiring. Imagining the possibilities as I type...feeling lucky? Hopeful is probably a better word. My birthday is monday (the 4th- not 7th!) so i hope my birthday is lucky this year!!! LOVE THIS! I have all my fingers and toes crossed, hoping to win!! thank you for such a generous offering ... crossing my fingers extra hard!!! SUCH a fun giveaway! I am feeling lucky today, hopefully I'll be lucky too. Thanks for the chance! What a gorgeous collection, vey vintagey! Thanks for the chance to win!!! WOW, what a fabulous bundlle of goodies! I would love to be able to play with those. Oh my gosh what a great bundle. Looks like so much fun. Thanks for the chance to win. I'm feeling lucky...and hopeful too! Thanks for the chance! I would love to win these awesome products! Pick me! Pick me! What a prize stash! Thanks for the opportunity. That's a great giveaway..... and the inspiration! Gypsy has such great products and it would be fun to make this drawer! Love this little drawer and the Postale collection, and would love to win! Thanks for all the great ideas and for the giveaway. Yes, I'm feeling verrrry lucky! I love the drawer, it must me mine! Lol! Would love to win all these great goodies....thanks for the chance! Thanks for a chance to win this awesome prize! Love this! Thanks for the chance to win such a great bundle of goodies! What a great give-away! Thanks for the chance! I need one of those! They look so fun!!! Lucky us for having a chance to win! Thank you! In LOVE with the findings! Pick me, pick me please. Lol. I would love to win. Not sure if I'm feeling lucky but sure feeling blessed. Thanks for the chance!! Yes! I'm feeling lucky! I found an abandoned bird nest on the sidewalk yesterday, so I hope I find I'm a lucky winner of this fabulous prize! Donna Jean "Catmomma" Anderson. Cool! You never know when luck will find you! Such gorgeous examples of the drawers!! LOVE them! TFS and thanks for the chance to win. LOVE all these goodies - thanks so much for the chance to win! I've been a bit woozy today - is that a lucky feeling??? Such wonderful goodies. Thanks the chance! yummy Goodies . . . Thanks for the chance to win! just so enjoy your posts...look forward to that new one popping up! Thank you for sharing all the inspiration and of course a chance to WIN this Wonderful giveaway! I love the library drawer and the new Postale collection! Who wouldn't want to win this giveaway? Pick me! It is funny how a contest brings out the comments. I would love to win…in fact I have looked at this system for quite awhile but haven't jumped in. Such cool goodies. Thanks for the chance at them. Please pick me - pretty please! I love this collection of awesome stuff! Oh me! Me! Me! Please pick me! I absolutely adore the library drawers and all of the fun ideas you have to go with. Okay, the crafty inspiration you have included doesn't hurt either!! Love it all and thanks so much for the chance to win BIG! Oh, how fun it would be to win this fabulous collection of goodies from 7G. Oh boy ... do I have some coolio ideas for this sweet library drawer. Super cute! I hope the planets are aligned, and the stars favor me, because my LSS don't carry 7gypsies, and my mum won't order online until my grades improve, and since it's June 1st I'm thinking the gypsies and I won't be seeing each other til next year. I would love to win! Please pick me!!! 7gypsies is one of my fave companies. Would love to win!!! Thanks for the chance! Gosh, this is fabulous, thanks! Love the library drawer and all the gioodies that go with it. Thanks for the chance to win it all. I had a library drawer of my Grandmothers. It held her recipes. After years of moving around with my Air Force Husband, it disappeared. I did manage to save a few of her cards. oh wow! that is a hefty prize!! and what inspiration, too! Postale is my favorite line! Thanks for your inspiration and generosity. Everything is gorgeous!! I would be estatic to win all this yumminess! Love all these products! So many creative uses for them...hope it is my lucky day! Ohhhh....I would lov to be a winner!! Wow! What goodies!! Thanks for the giveaway. Love the projects and the drawer - this is a great giveaway, thanks! Wow, what a wonderful give-away!! Thanks for a chance to win such great products. I'm never lucky, could you pick me? Wow, what an awesome giveaway..thxs for the chance to win and good luck everyone!! wowsers, I love this project!! really would love to win it!! Great giveaway. Love the library draw, perfect for recipe cards! Oh, wow! I would love to play with those! The Library Drawer is awesome and the projects posted are fabulous. Thanks for the chance to win some 7gypsies goodness, I just love their products. Oh, that would be so fun to play with! Thank you for a chance at it. I hope I get a lucky day on "One Lucky Day" - this would be like opening a treasure chest - oh, the things I can imagine I can do with these goodies!! Oh my gosh I am SO inspired by your blog...I have even talked my husband into going to Paris after I saw that! Simply amazing. Thank you bunches! What a great giveaway! Would love to win this one for sure! The best of the best! Oh, how I'd love to get my hands on these pretties! Thanks for the chance to win! Great projects! I totally love the library drawer - great giveaway! Thanks for the chance to win!! I love 7 gypsies!!! I would be wonderful to win the bundle. Thanks for the oppuritunity. Great giveaway. Count me in.. Thanks.. Enjoy your weekend. There are a lot of people feeling lucky today! Thanks for the great giveaway, and sharing your creativity with all of us. Oh my gosh! This is a fabulous give-a-way! Love it! I am really feeling lucky right now! WoW, what a great give-away ... this has been on my 'Wish List' for months! Thanks so much for the chance! 7G postale is so unbelievably cool...I would just burst if I received this...and just sit and pore over it for a few days..so fun.. I am not feeling lucky, but I wish to win this gorgeous giveaway! Thank you for a chance Deb! I love the library drawer! It would be such a treat to use it and all those goodies to create something special...thanks for the chance! thanks for the chance to win! i love 7g library trays - i have taught 2 different classes with them - very popular! would love some postal stuff too! What a smashing 7 Gypsies jackpot of goodies! Had a chance to try out those stamps at a class; they were so much fun to use! The possibilities are endless. What fun! nice project you showcased today! thank you for sharing. I am loving that library drawer! This librarian is feeling lucky! giveaway! Thanks for the chance to win this great giveaway! I love 7gypsies! The library drawer filled with goodies would be fun to win! Thank you! Ooooh, these are gorgeous!! I would so love to win, I have hardly any 7Gypsies goodies, which is terribly sad.....(Hoping for the sympathy vote...) :) Thank you for the chance to win. Wuuuuuuuaaaaaaaaau... really hope I'm lucky ;) Great blog by the way! This is fabulous. The detail and care is so inspirational. I have my fingers crossed. I hope this is also available in the Netherlands soon!!! I would love to win these awesome goodies. Thank you for the inspirational ideas and thanks for a chance to win. The two samples are G O R G E O U S! What a great give-away! Thanks so much for the chance! What's not to love about 7 Gypsies! Rnajini's work is always fabulous and so is the Postale collection. Thanks for this fab giveaway opportunity! What a great bunch of goodies! I can totally see me gathering pictures of my girlfriends for this project. And the 4th happens to be my birthday so maybe I'll be one lucky girl! Thank you for the chance at a cute giveaway. That's one heck of a prize package! One I would love to have! Thanks for the chance! This is a great prize package! Thanks for the chance to win. Waiting oh so patiently for this line to make it to my lss! Would love to win it before I can buy it! Thanks for the chance. cool beans, i'ld love the chance to create with all of the goodies. thanks so much for sharing these ideas. i love to seee hwat different manufactures are out there and what they have to play with. so much fun waiting to happen...! I'm thinking it might be a good place to store some of my bulkier ATCs... Thanks for the chance to win this amazing bundle! What a wonderful prize! Thanks for the chance to win! Let's see if the Luck of the Irish is with me!!! Thanks for the chance to win - all of that is simply AMAZING! Endless possibilities. I have always been drawn to the vintage look. 7 gypsies just never disappoint! Ooooh, love the library drawers and 7gypsies. The projects are very cool. What a beautiful creation! Love the library drawer...endless possibilities. Thanx for the chance to win! oooo la la! I love library drawers! Love your blog and love a chance to win a library drawer! Totally awesome ! Thank you so much for sharing your inspirations ! Love this ! I've been searching for One Lucky Day for so long, and I'm so glad I found you! What a fabulous giveaway!! Great give away!! 7 gypsies is the bomb!!! Would I like a chance to win??? You bet ya you bet!!! I have been drooling at those drawers and would love all the accompanying goodies as well yep!!! Wow 193 posts...we all are hoping we are "winners" of some wonderful products. Recently bought 2 different 7gypsie shadow boxes. What fun to play with, hope I can play with these as well. What a great giveaway and thanks for the chance to win. 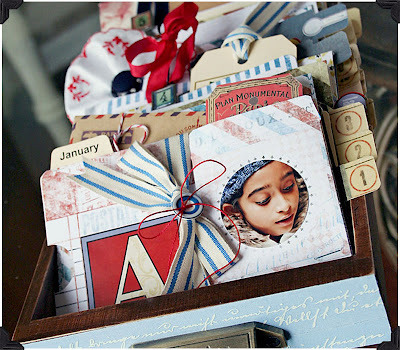 I love the whole library drawer look...so vintage and fun! love the drawer, and also what you have done with it.....hope it is mine!!!! i AM feeling lucky! And would love to play around with those goodies!! this has to be the best giveaway ever! hope i'm lucky!